God not only cares for you, He cares for you deeply . . . so deeply that He is not only there with you in your storm, He has promised to take you through to the other side of it. In my weekly sermons, I frequently discuss the definitions of words used in the Scriptures in the original languages, because our English translations don’t always capture their full meaning and impact. I generally don’t do that in these short blog articles, but today I am making an exception. I’d like to introduce you to the Greek word sumpatheo (pronounced “soom path EH oh”), translated as “sympathize” in the passage above, which means much more than we might think it to mean today. You and I hear the word sympathize and probably understand it to mean feeling sorry for someone . . . having a bit of pity or compassion for someone who is experiencing a difficult situation. In the original Greek text, the author of Hebrews used sumpatheo, which means . . .
TO BE MOVED BY SOMETHING THAT HAS MOVED SOMEONE ELSE! In other words, our Lord Jesus Christ is moved by the stuff that moves us. He suffers when we suffer! You may find that hard to believe . . . that our Lord is that concerned with the details of our lives. Sumpatheo rises well above the level of feeling compassion or pity for us when we are facing some difficulty in life; it goes far beyond Jesus “feeling sorry for us” when we are in the midst of a storm. The sympathy Jesus has for us is sympathy for a pain or heartache that He has already experienced; He has gone through what we are going through, and He is willing to do something about it. The storms in our lives become His storms! The double negative—“We do not have a high priest who is unable to sympathize . . .”—is a profound positive proclamation that Jesus is with us every step of the way. Our storms do not scare away our Savior. 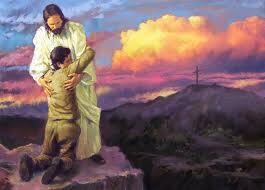 Do you see how intimately personal this makes our Lord? He is right there with us in the middle of every storm we face. The God of the universe is deeply concerned with the affairs of our lives; He hurts when we hurt, and He sympathizes with us as we navigate (and sometimes stumble) through every difficulty that blocks our path. There is nothing that moves us that doesn’t also move our Lord. And don’t forget this: God both sends storms in our lives and allows others. Scripture speaks of the “stormy winds that do his bidding” (Psalm 148:8). These storms always come for the same two reasons: His glory and our good. When we know that our Savior cares deeply enough to sustain us through every trial, we are able to face pain and heartache with the confident assurance we will get to the other side . . . because He will take us there! And when we arrive, we will be better than we were before, because we will be able to testify of His great grace and sustaining power.